This gorgeous weather we are having in Austin has everyone talking. Given the weather, that it is Friday and date night I am sure we are all looking for something fun to do tonight. Sounds like tonight calls for Peter Pan Mini Golf. 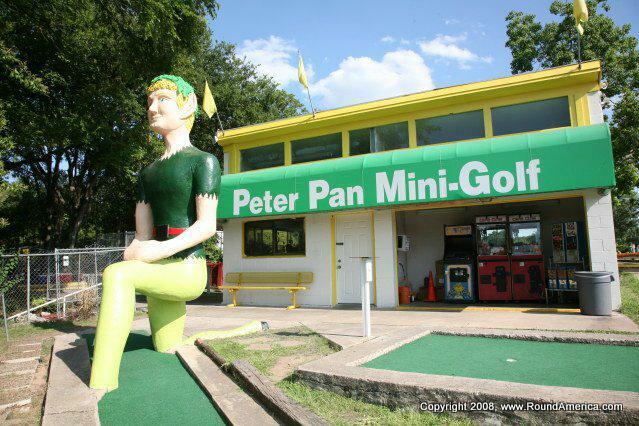 Peter Pan Mini Golf is the perfect place for a feel good, old time type of fun. I do have to say that the best part may be that it is BYOB (NO GLASS), so if you feel like sipping a few cold ones while playing mini golf just bring them along. The later you go, the more fun it gets. At $5.00 for 18 holes and $2.00 for another round, you can not go wrong. It is CASH ONLY! It has a very “Austin” feel so do not go there expecting a 5 star course, I am guessing it was built in the 1960’s and hasn’t been updated since! All and all its fun for any age.